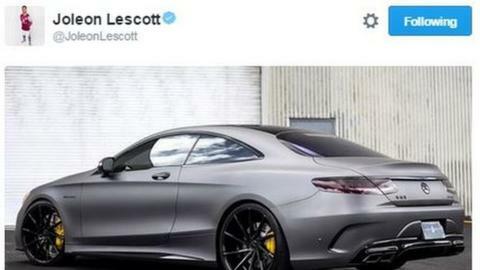 Joleon Lescott apologised for tweeting a picture of an expensive car after Aston Villa were thrashed by Liverpool. The Villa defender claimed it was "accidental" and sent from his phone in his pocket while he was driving. The 33-year-old's tweet attracted ridicule following Sunday's humiliating 6-0 home defeat which leaves Villa eight points from safety at the bottom of the Premier League. Lescott also apologised for "the team's lack of commitment". "I'm not one for tweeting after games whether it's a good, bad or indifferent result," added Lescott. "But I would like to apologise for the performance today, personally and collectively", tweeted Lescott.